Remember: Be unique. There are usually a lot of articles around the holidays or at the beginning of seasons. Don’t be discouraged by articles with similar headlines. Make your article reflect your voice, your niche and your value. Celebrate the holiday season by writing and submitting some new articles today! When you’re finished, spend a few minutes mapping out all of your holiday and seasonal articles for 2010. Good article, and great idea-especially for us newbies who are still learning! Don’t think I’ll get an article on this done for Christmas, but think it will be GREAT for the additions I’m adding to my website in January, for Valentine’s Day! I always find the article content layouts you provide extremely helpful. It definitely gets rid of any writers block problem. Merry Christmas and all the best to everyone at EzineArticles! Thanks for everything you do all year for us. This should help me a lot. 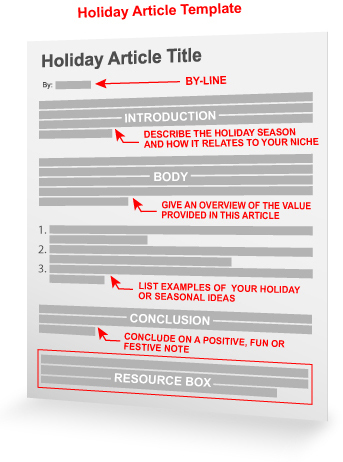 Should work for non-holiday articles also. Thanks for the layout and the inspiration! Wish everyone to have a good holiday, I’m a Chinese? In China,he most important festival is New Year’s Day.I look forward to the arrival of Spring quickly? Great !! Layout, Thank you. It can be all the time template. Thanks for the idea. I’m getting ready to take a stab at the Christmas challenge, so I can use all the ideas I can get. This article helps me to get started. I am new to creating a website and blogging. It’s been pretty exciting so far. Still nervous about the process, but I will just take baby steps until I get on track. Useful, thank you for your introduction.